North Korean historians claim they have unearthed a unicorn lair. A report released by the History Institute of the DPRK Academy of Social Sciences claims that archaeologists discovered the lair of the mythical animal just outside a temple in the capital Pyongyang. And, unsurprisingly, the lair – according to the report – means that Pyongyang was the focal point of an ancient, united Korea. It goes on to say: “A rectangular rock carved with words <<Unicorn Lair>> stands in front of the lair. “The carved words are believed to date back to the period of Koryo Kingdom (918-1392). Jo Hui Sung, director of the Institute, told KCNA, the state news agency, that the findings is in keeping with the country’s history. He said: “Korea’s history books deal with the unicorn, considered to be ridden by King Tongmyong, and its lair. “The Sogyong [Pyongyang] chapter of the old book <<Koryo History>>,” said Ulmil Pavilion is on the top of Mt. Kumsu, with Yongmyong Temple, one of Pyongyang’s eight scenic spots, beneath it. 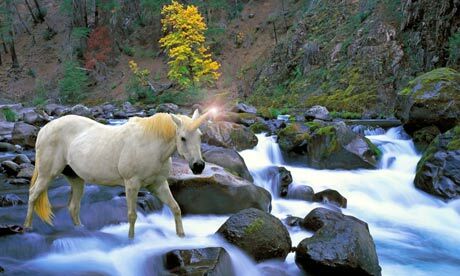 The legend of unicorns is thought to have stemmed from European folklore, in which the animal resembles a white horse with a single horn. Until the 19th century the beast, considered a symbol of purity and grace, was still thought to exist – even by academics and theologians. But since then there has been little to suggest that there are lairs elsewhere in the world. The unbelievable news does however follow a number of bizarre claims to come out of the country. It has been suggested, however, that the release of the story could be in retaliation against a spoof North Korea related story which tricked a newspaper in China. Written by satirical website The Onion, China’s Communist party newspaper, The People’s Daily, fell for claims that Kim Jong-un was named as the sexiest man alive. At the women’s World Cup of football in 2011 the North Koreans put their poor performance down to being struck by lightning. Five of their players later tested positive for steroids. Most of the more unusual claims stem from former leader Kim Jong-il and his biographer. According to the book he reportedly warned the public in North Korea that he could control the weather with his mood. He also claimed his birth had been prophesied and was heralded with a double rainbow and a new star in the heavens. Years late Kim Jong-il was apparently very busy during university writing no fewer than 1,500 books in three years and composing six operas. But it wasn’t just the arts he took a keen interest in. Apparently, in his first and only ever round of golf he shot 38-under with 11 holes in one. Satisfied with his performance, he reportedly immediately declared his retirement from the sport.